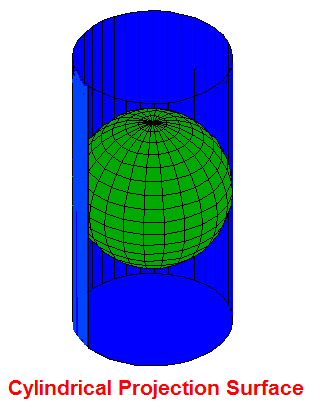 A cylindrical projection results from projecting the features on a sphere onto a cylinder that is wrapped around it. If the axis of the inscribed sphere is parallel to the axis of the cylinder, then all longitude lines will be straight and vertical while all latitude lines will be straight and horizontal. (If the axis of the inscribed sphere is NOT parallel to the axis of the cylinder, then only the center longitude line will be straight and vertical.) Features of the sphere will be stretched horizontally in the projection as a function of the latitudinal distance from the origin, which is usually the equator.